As you can see I'm a sucker for dry shampoos and Batiste is my favourite so I couldn't miss an opportunity to stock up. I already had one in the cupboard so I picked up another four which should get me through the next few months. I don't use it every day, just a couple of days a week but it's great for giving volume to roots as well as drying up excess oil. I also picked up the Botanicals Safflower Rich Infusion Masque for Dry Hair which smells amazing. I haven't tried it before but will report back in another blog post if it works like it should. I also picked up a sachet of the Hask Greek Yoghurt Repairing Deep Conditioner because Winter equals dry hair for me and I'll try anything to fix it. The last couple of things I picked up were hair ties. Some plain black snag-less ones for me and some cute little colourful ones for my daughter. I already use the Models Prefer mini hair ties on my 1.5year old but I picked up some more because we're forever losing them and they work really well in her hair. Have you checked out the sale yet? I'd love to know if you picked anything up or if you have any recommendations for Shampoo & Conditioner? *All products were purchased by me and this post is not sponsored. I wish it was though haha! Honesty Always. Wow you got your haul up fast haha. I only just managed to take an Insta photo. Great picks! I was so tempted to try that new Botanicals range. I love Batiste Dry Shampoo! It's so good and so affordable! That's a brilliant haul. 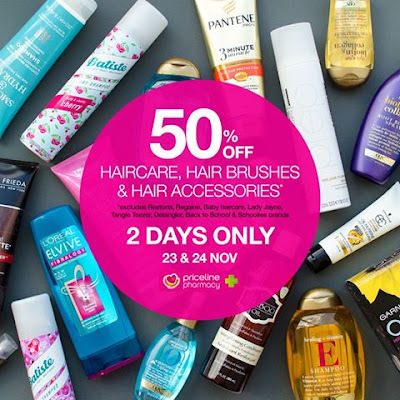 I love a good sale at Priceline. The Botanicals Safflower Rich Infusion Masque for Dry Hair is on my wish list! I actually really like all the new products in this range! They must be really good! Most especially the Tropical one.